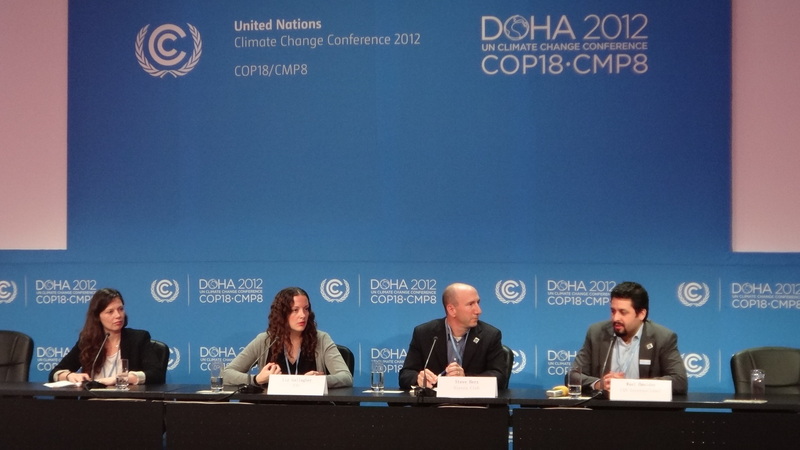 I was early today at the Qatar National Convention Centre (QNCC) to catch up with fellow delegates as well as to listen to Climate Action Network (CAN) International’s Press Briefing on Non-Governmental Response to Negotiations. Another way to get a summary and impressions on the negotiations aside from the Stock Taking Plenary (happening tonight at 1800 chaired by the COP18 President, H.E. Abdullah bin Hamad Al-Attiyah) and hear it from dedicated NGOs through CAN who currently have an Arab (Lebanon) as its Director. Wael Hmaidan, CAN International Director, noted that “the Arab leadership has failed us so far,” however, with two full days more in the negotiations, they are optimistic for pledges, bring spirits up, and help raise the ambition gap. A photo grabbed from a video clip of emotional Saño. Yesterday, an intense and uncharacteristic typhoon slammed into an island Mindanao, south of the Philippines, but still not sure as of this writing on the damage it has put again to my highly vulnerable country. 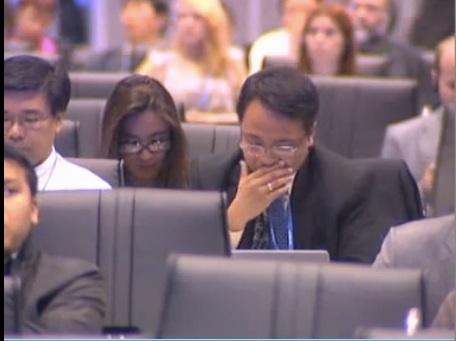 I missed the plenary, nevertheless, able to watch it online and saw a senior diplomat breaks down in public. Was it a signal that other countries must pay attention? It happens rarely, but can it have a dramatic effect? “I appeal to all, please, no more delays, no more excuses. Please, let Doha be remembered as the place where we found the political will to turn things around. Please, let 2012 be remembered as the year the world found the courage to find the will to take responsibility for the future we want. Still a day or two towards the closing of this conference and having a roller coaster ride with my emotions – high, down, sideways – maybe due to my first ever COP, upcoming Christmas holidays with my family, Qatar Sustainability Network and SustainableQatar, whatever it is, I am optimistic that these climate talks will yield to the results we all want to achieve for the current and especially for the coming generations. And, yes, I believe that Qatar will do its best to be remembered as the conference where it demonstrated a lead role in climate negotiations. They. Just. Will….and that is exactly why we (SustainableQatar and QSN) are here, too! NB: For those of who cannot enter the QNCC premises but wish to watch open sessions, visit the UNFCCC site.